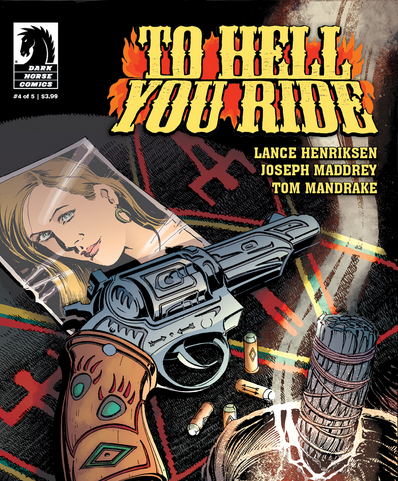 To Hell You Ride, the five-part comic-book epic by Lance Henriksen, Joseph Maddrey, and Tom Mandrake roars back into the pop-culture spotlight with the publication of its fourth issue on May 14…in just a few short weeks. This fourth issue of this inventive horror series finds Jim Shipp’s quarantined town still under siege by the government’s black helicopters, and now by foreign nationals who have been authorized to kill Americans with impunity in order to contain the crisis. The contaminated snow which is responsible for the deaths and the consequent occupation has caused the town to become “divided against itself,” a metaphor, perhaps for America today, almost universally caught in the grip of fear. That fear, interestingly, is termed an “addiction” in the comic, and addiction ties in with the saga’s running themes, I submit, about contamination and also avarice. To Hell You Ride implies a modern society overdosing on fear, greed, and violence. The same emergency has also created two breeds of people, notes the narration: The Insiders, who hide behind locked doors and are afraid of the snow, and the Outsiders who are afraid of the heat that the draconian presence of martial law now brings to them. Instead of unifying as a single, strong force, the Insiders and Outsiders turn on each other with lethal ferocity. Sheriff Shipps -- the Lance Henriksen character, essentially -- finds himself in an impossible situation here, attempting to preserve his town as it once was while all Hell breaks loose. Armed mobs have begun wandering the streets, opening fire on others, and this issue witnesses the death of a major protagonist. Finally, the story ends with the ominous notation that “The End is Here,” a reflection of the fact that the final chapter of the saga is upon us. Intriguingly, this fourth chapter of the saga also introduces the “Spider,” the creature/being who strides atop the web of time, and I found this character to be a sinister reflection, oddly enough, of the other corrupt humans we’ve seen so far, in the story, namely Blackwash and the (now-deceased) Mayor Cubby Boyers. 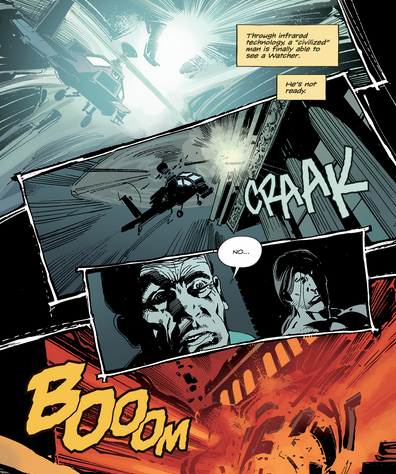 To write too much more about The Spider and the fourth issue’s narrative would ruin some of the surprises, but suffice it to say that To Hell You Ride still possesses the power to shock and awe, and to deeply unsettle. 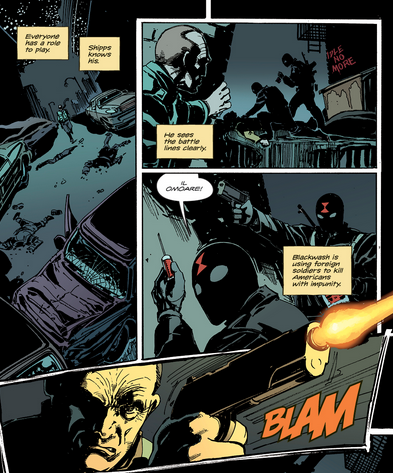 There’s a pulse-quickening momentum behind the pages here, an inevitability that can’t be denied. As I read the tale, I kept thinking “the die is cast,” and (in the spirit of a favorite Henriksen movie, Pumpkinhead), that the curse is going to run its course, with all the damage that “course” entails. With that sense of inevitability in mind, the last frame of Issue #4 is very ominous because of what it portends for another protagonist, and I get the feeling that things are not exactly going to end well. I’ll be eagerly anticipating the final chapter of To Hell You Ride, and remembering, specifically, the fourth issue’s words about death. Death is not an end, only a change in shape, a shift in worlds. Thank you very much for the review, enjoyed all 4 and looking forward for #5.